When cutting stoles from especially wide fabrics would you cut them across the fabric or along the fabric? And the same with maniples? 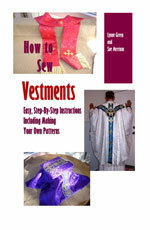 I have made several several stoles for my role as deacon in my congregation. Depending on the pattern in the fabric is the best way to decide how which direction to cut. Solids and overall patterns with small repeats could be cut across but where this is not the case... It was worth the investment in the extra fabric to buy 2 yards and only seam on the shoulder for the deacon or in the back for the priest's stole. If the pattern allows or if you can't get the full length in yardage the fabric can be pieced like in patchwork quilting. With careful matching of the design the joint can be almost invisible. I have gotten beautiful brocades discounted as remnants and saved a good deal of money by using the above approach. I would cut them across the fabric, because you'll take up less fabric that way. Just make sure you're on the strait of grain. The same would go with maniples.